Here we are at this highly anticipated blessed day. Jeff is getting married. 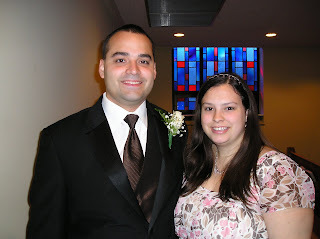 It was a great wedding, with only minor mishaps, such as Bro. Eddie almost catching on fire, and the ring bearer who face planted at the end of a few steps off the stage. It really was a besutiful wedding and we were happy to be able to be there, and Tim was so proud to be a groomsmen. He and Jeff lived together for 8 years and they are practically brothers, and Jeff has spent a few Christmas's with us when he was unable to go home to Colorado. Kibbie is a great woman and we are excited to add her to the gang. Much Congratulations to them. Since this time, the happy couple has made it back from the honeymoon, and are getting settled in, we are so glad they made it back safely and now the real fun can begin. I can't help but notice in this picture, how much Tim and I look alike. Hhhmmmm, wonder which one of us our baby will look like. 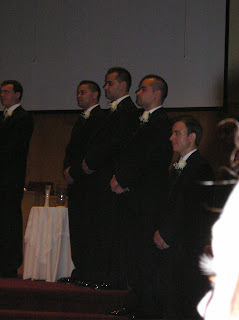 There is the groom and the Ibarra men and Bro. Kevin. Daniel was the best man, while Tim and Marc were groomsmen. Here we are again. The photographers set up a backdrop in the nursery to take pictures, I thought that was a great idea. Here I am 4 and 3/4 months pregnant. I was so excited my graduation dress still fit. 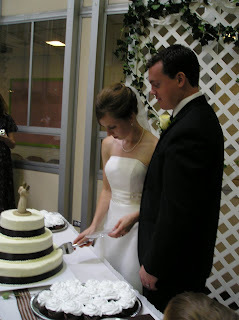 Happy couple cutting the cake. 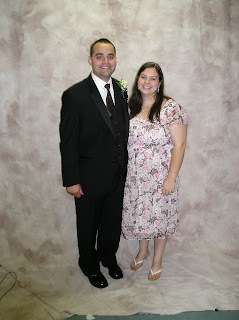 They took almost all of their pictures before the wedding so there was not much of a wait, and things ran quickly and smoothly. The more I think about it that whole pics before thing really is a good idea, if you are both willing to do it. Their cake looked really nice and tasted good too, but those chocolate cupcakes were to die for. I could only eat half of one the were so rich, but delicious.